If you are arriving in Scotland by plane and are coming to Cowal, the closest airport is Glasgow Airport. From there you are less than two hours from Cowal. You can hire a car from one of several car-hire companies at the airport. Check the Glasgow Airport website for information and on-line booking. To get from the airport to Cowal drive onto the nearby motorway (M8) and go west. After a few miles it will turn into the A8 (an ordinary fast road, not a motorway) – keep going. At the town of Greenock a junction will take you onto the A770 signposted for Gourock. Follow that road along the shore through the town of Gourock and out westwards The car-ferry (Western Ferries) is at McInroy’s Point. On arriving at Glasgow Airport, you may prefer to take the train. If so, go to the nearest railway station at Paisley Gilmour Street (take MacGill’s bus, no. 757 or a taxi – it’s a short journey). From there take the westbound train to Gourock, and walk 100 yards from Gourock railway station to the Argyll Ferries terminal (‘the wee ferry’, which doesn’t take motor vehicles but will take your bicycle free of charge). You don’t need to book. 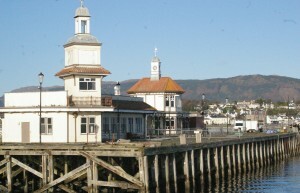 It arrives at Dunoon at the pier close to the town centre. You may be arriving by plane at Edinburgh Aiport. There you will also find several car hire companies plying their trade. Check the Edinburgh Airport website for information and on-line booking. Alternately, if arriving at Edinburgh, take the handsome new tram or a bus or taxi into town, take the train from Edinburgh Haymarket station to Glasgow Queen Street, walk ten minutes (or take a taxi) to Glasgow Central Station and take the train to Gourock, and take the ‘wee ferry’ (Argyll Ferries, as above). It sounds a bit complicated, but it’s an easy journey and you should be in Cowal within four or five hours of landing at the airport. If you are coming to Scotland by train, take the Gourock train from Glasgow Central, and then the Argyll Ferries crossing (as above). If you are coming from the Central Belt of Scotland – Glasgow and further south and east – the simplest way to get to Cowal is by the Western Ferries crossing from Gourock (as described above). If you are coming south from Oban, you may have been visiting the ancient monastery of Iona before coming to Cowal, perhaps visiting the community there), or seeing parts of the Highlands further north. On your journey south to Cowal, coming down the A816 (the main road from Oban to Lochgilphead and on to Cowal), you should visit the astonishing landscape of Kilmartin Glen, with its 5,000-year old monuments, bronze-age rock carvings and medieval church sites and carvings. Here Kilmartin Museum does a wonderful job of interpreting the ancient landscape and its artefacts. It also serves great food – the perfect place to stop for lunch. You may be arriving in Cowal from the north-east and east. In that case you will arrive via Tarbat and Arrochar (a narrow neck of land connnecting Loch Lomond and the head of Loch Long. Follow the A83 westwards, over the Rest and Be Thankful, and at the west end of Glen Kinglas turn south-west along the A815. The loveliest way to arrive in Cowal is by sea. This is how people moved around the Highlands and Islands for most of our history – farmers, warriors and monks – for whom the sea provided a highway, while the land was generally an obstacle. The waters of the outer Firth of Clyde can bring you to Cowal from several different directions. Ferries to Cowal: blue for CalMac; red for Argyll Ferries; green for Western Ferries. As already mentioned, from the south, Western Ferries run regular services from Gourock to Dunoon (Hunter’s Quay). You can travel by car or bus on this route, or as a foot-passenger or cyclist. The crossing takes 20 minutes. Also sailing from Gourock is the Argyll Ferries crossing. The Argyll Ferries boat does not take cars or motor-bikes at present, but you can bring your bicycle (free of charge). Argyll Ferries have the advantage of connecting with train services from Glasgow, so that you step off your train and more or less straight onto the ferry (and you can carry your bicycle on the train for free too). But you can also sail to Cowal from the west. CalMac Ferries sail from Tarbert on Kintyre and land at Portavadie in western Cowal, not far from Kilfinan. CalMac will also take you to Cowal from the Isle of Bute, on what must be one of the shortest ferry-journeys in the country. The crossing takes only five minutes, across a beautiful narrow stretch of water called the Kyles of Bute. It lands at Colintraive (the name here is Gaelic caol an t-snàimh, ‘the narrow place of the swimming’, for this was where for centuries the cattle reared on Bute were swum across the narrows to be driven overland to market). If coming to Cowal this way, you would probably take a CalMac ferry from Wemyss Bay on the mainland to Rothesay on Bute. Do have a look round Bute while you are there. An unmissable attraction there is the ancient monastery of St Blane at Kingarth – a beautiful and fascinating site, with early carved stones, one of the earliest attested churches in Scotland. You can drive around Bute of course, but this is great cycling country too, and for walkers the West Island Way runs from Kingarth in the south all the way along Bute to the Colintraive ferry at the north end, connecting you to the Cowal Way – another great walking route.